Welome to our FAQ page! Here you will find a list of common questions that we get asked, along with some advice on certain requirements such as stage size, generator voltage, set up and performance times. We strongly advise all couples and people booking us that they read this section as we have done it to help you and make sure you have the best party possible! Please make sure that you have a good read and discuss with your Event organiser, Venue or Wedding planner as appropriate. We will be happy to discuss or answer any queries that you may have regarding any points not covered below. Does the Band have Public Liability Insurance / PAT Certificates? Yes. These can be produced on the night or emailed to the venue before your event. The band arrives to set up and soundcheck at 6pm (this is usually after any evening food or speeches). If you require the band to set up any earlier than this, you will need to make us aware of this during the booking process as this will incur an additional fee. The band typically perform two 45 minute sets with a short break between them with encores usually bringing the total performance time to approximately two hours. However longer performances can be tailored to suit your individual requirements and can be selected within our event packages. I want to serve food when the Band is on or just before they perform is this a good idea? Our survey says: No!!! One of the most common mistakes to make is organising food just before, or during the Band's first set. This really inhibits your guests ability to fully enjoy the band and will dampen the party atmosphere. So please make sure that you allow at least half an hour for your guests to have their meal before the first set start time. Though we understand each event will differ and you will require specific start times due to venue or time scheduling, we would recommend playing our first set at 9.30pm. This will ensure that your guests have had enough time to let their food go down, get slightly merry and are ready to hit the dance floor. We will provide background music in the interim between sets. For more information on our recommend event plan, please see "What is the best time to have the band perform?" below. What is the best time to have the Band perform? This can be arranged when booking, we are flexible to the requirements of your event. Please allow at least 30 minutes after your guests have eaten before the Band's first set performance. No one likes to dance on a full stomach and this will help to maximise your guests enjoyment of your event. How much room does the Band need? The second most common mistake is not allowing the band enough room to perform. Once the equipment has been set up and soundchecked we are not able to move it. 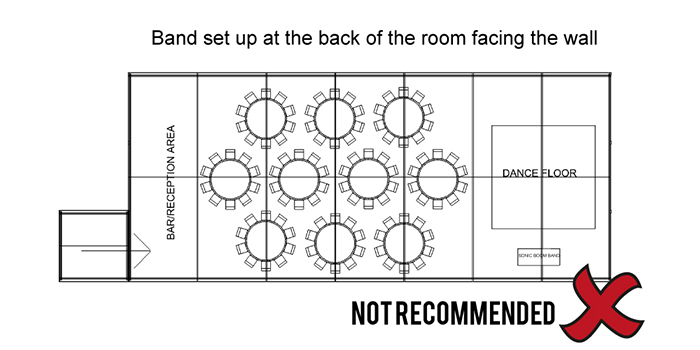 So please ensure that if you have multiple acts on the same stage that you allow adequate room and set up time (see How long does the band need to set up? for details) for us and your other entertainers to work to. It would be preferable for you to send to us a schedule of events at the time of booking, so that we can work together to help things run as smoothly as possible on the day. As a guide the band needs enough room to cater for drums, bass and guitar set up, PA system and lighting rig. The minimum space required is Width -16 ft (4.87 metres) and Length (depth of stage) 10 ft (3.1 metres). We can adapt to spaces and venues but these measurements will give you a guide. If you have also booked a DJ for your event, please can you let them know that the Band will require the above space to set up. If you are laying a dancefloor down in a marquee or venue please allow at least 3 metres from the back of any wall to the edge of the dancefloor - so the band can actually fit their equipment in and not be on top of your audience. Failure to do this could result in either damage to the bands equipment (which could result in the band being compensated) and possible injury to your dancing guests. One area that often gets overlooked when planning out the evening is where the band are going to be located in relation to the dancefloor and the bar. You are paying us to provide your guests with a fantastic nights entertainment and so it stands to reason that you will need to think about the ideal position for us to deliver on our promise - to rock their socks off all night. It makes our job harder if we are: 1) facing away from the guests or staring at a marquee wall instead of the audience. 2) placed in a corner without enough room for us to interact with and entertain your guests (see How much room does the band need?). We have included below two "SB approved" marquee layouts and one "not recommended" layout to give you an idea of what we are talking about. Will I need to organise a stage for the Band? Most wedding venues and marquees do not require us to have a stage purposely built as there is usually an area for the entertainment to set up and perform from. We are happy to do this in most cases and find the majority of venues have the capacity to accomodate the entertainment. However if your event is outside then we will need to be placed in an area that is fully covered and on dry levelled grounding so our electrical equipment does not get damaged in the event of any rain. Failure to provide adequate waterproof covering and levelled grounding for us and our equipment could result in us turning up and refusing to set up due to the risk of our equipment being damaged by the unpredicatable British weather. If your event has more than two to three hundred people attending then we would also advise that you look into hiring stage facitlites for us to perform on as well as security to manage the guests and our stage area. Please note that if any of our equipment gets damaged during the time we are at the event by a guest or anyone else other than the band then we will have to invoice you for the repairs/replacements. It may also lead to us having to stop our perfromance mid set which is something we all want to avoid. We have found from our experience that disclosing all this information during the booking stage that we are in a better position to help you plan a fantastically safe event where everyone has a great time. Festival themed outdoor weddings are becoming a very popular choice for couples and we have loved performing at them. Our stage requirements for these sort of outdoor events are: Width - 16ft (4.87 metres) and Length (depth of stage) 10ft (3.1 metres). Where do I place a dancefloor? We perform at events where a dancefloor is usually hired or brought in externally. 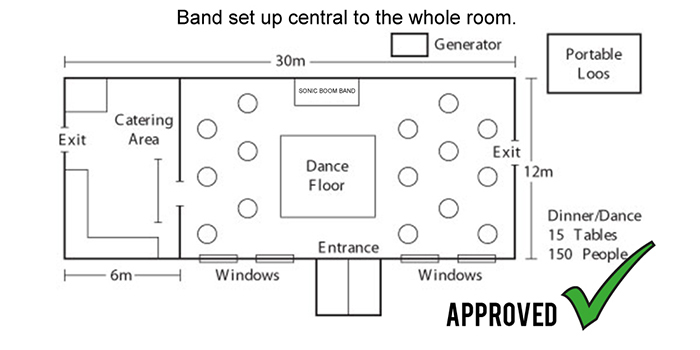 When a stage has not been organised for us to perfrom on please ensure that the dancefloor is placed at least 3 meters away from any marquee/venue wall to allow the band enough room to set up their equipment. This will ensure that Sonic Boom are not on top of your guests, as this may result in equipment being damaged or your guests injuring themselves by falling or tripping over our equipment whilst dancing. Please remember you will be invoiced for any equipment broken by you or your guests as a result of ignoring this advice given before your event. How much Voltage does the Band's equipment require? We get asked to perform at a lot of private parties and outdoor events and this may require some of our customers to hire a generator. The band needs enough power to cater for all of their PA, lighting and musical amplifiers, so if you are having to hire your own generator for an event, the bands power output will be just under 10KVA, which means that you will need to look at a power source of well over this to ensure that your generator will have enough headroom. How long does the Band need to set up? 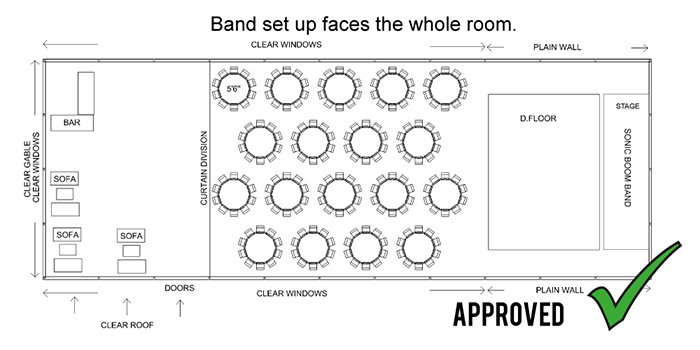 Ideally the band needs a minimum of 2 hours to set up before performing. Please allow extra time if your occasion is on any floor other than the ground floor or if there are steps, walkways or other access restrictions to the venue. For an additional fee the band can arrange an early setup for convenience. The band will need to carry out a sound check before they begin their performance so please bear this in mind. This is to ensure volume levels are appropriate for the venue and to diagnose any acoustic or feedback issues. Does the Band have lighting? Yes the band has its own professional lighting rig which helps to create a fantastic ambience at your event. This includes stage lighting so you can see the band whilst they perform, and lighting to shine on the dancefloor for you and all your guests to enjoy whilst dancing. The band will bring along all their own lighting to your event and this will be included in the overall quotation given to you upon receiving your enquiry. Can I play my own music through the Band’s speaker system? Yes. If you require the use of the speakers through which to play an iPod or other device with 3.5mm headphone jack (first dance etc) then please be aware that there will be a small additional cost if you wish to use the bands speakers beyond midnight. Most of our packages run until this time (midnight) so you will be charged for every hour past midnight that you require the use of our PA and lighting system. If you would like a later finish then please make us aware of this during the booking process because if you do not our music and lights will be turned off at midnight. Please check our WEDDING BAND packages. If you want to bring your first dance or any special songs to be played through our PA system at any point of the night before midnight, then please bring the device with you and we will happily oblige. If you would like a DJ service at your event then please specify during the booking stage and for a small extra cost our resident DJ's Peachy Mix & DJ Spin can be booked along with the band and will be on hand all night to take requests from you and your guests. What kind of music do you play in between your sets? All of our weddding and party packages contain the "DJ replacement service" where the band bring background party music to be played post set up, in between the bands live sets and up until midnight or the event finish time (depending on the package you purchase). This music playlist contains popular party music from the soul, motown, funk, pop, indie, and rock genres to get you and your guests in the mood for the band and to create a fun and relaxed atmosphere. As we have over 8 hours of music on our playlist we are unable to list each song that will be played on the night but please feel be assured that the band have catered for lots of tastes. Sonic Boom are more than happy to use your own playlist if you want to bring it along on an iPod, iPhone or other device with 3.5mm headphone jack and they will simply plug it into their PA system. How loud is the Band? Sonic Boom is a high energy function band, we are lively and loud to ensure that your guests are dancing all night. Some venues unfortunately have noise restriction devices called Noise Limiters. These devices are designed to cut the power to the venue if a certain noise level is exceeded. Very often this level is set to below 90 decibels (db) which is as loud as a Tractor engine and quieter than your average baby crying. As the band uses a live drum kit there is a minimum volume that cannot be changed this is around 115db or higher. You will need to inform the band at the booking stage if there are any noise restrictions or limitations at your chosen venue. Some venues may be agreeable to bypassing the limiter or raising the DB level, however if they are not then it will compromise the band's performance and the package that you are paying for. We can of course, work with a limiter if the venue are not prepared to allow us a concession, however you should note that the performance will be significantly quieter and will lose some of its energy. As a further alternative, we can recommend that you choose one of our ACOUSTIC BAND packages which will still provide you with top quality entertainment for your event just at a lower volume. The Sonic Boom band always tries to accommodate all types of venue and room size for each and every occasion. Sonic Boom play a range of popular music, please see our SET LIST page for all the relevant information. If you would like to hear a specific song the band can not perform then please specify this during the booking stage and for a small extra cost our resident DJ's Peachy Mix & DJ Spin can be booked along with the band and will be on hand all night to take requests from you and your guests. Can I choose the whole Bands setlist? The band has a tried and tested set list that is aimed at not only you, but all of your guests to cater for all the musical tastes and ages of people attending your event. We will happily listen to any suggestions you may have, from our SET LIST page that you absolutley love or have seen or heard us perform previously live, but please trust the whole set to the professionals (us) as that is what you are hiring us for, to ensure everyone has a great night. Our experience of performing live for a number of years means we know exactly where to place certain songs during the evening set so they achieve their maximum potential and impact. The band will dress appropriately for each and every occasion, smart or casual. To view pictures please check the bands various social media pages or view our 'Instagram' gallery from this website. To see what we look like click on our GALLERY page. Can someone come and take pictures of my Event/Party? Our professional band photographer Peachy Pix will usually accompany us at events to capture pictures for our social media pages. Check them out if you havent already! If you havent already booked her within your party package then we suggest you do. She is the photogrpaher who is responsible for the superb image of all of us on our website home page and the majority of our social media pictures and videos. Not only is she is very talented and friendly, but as most photographers leave after the first dance they miss capturing the best parts of the night! Have no fear as Peachy Pix can! So whether its capturing dad dancing , grandad or grandma slow dancing, you going crazy with your friends or singing along with the band you wont have to miss out. Simply message us asking for her services to be included along with ours and we can send you a quote for her services. This will mean that you will have professionally edited high quality images to look back on for years after your event. You can't put a price on those sort of memories. Please allow two weeks after your event for images to be sent to you via Wetransfer. You can then simply download them and they are then yours to share and enjoy. PeachyPix is also one of our female DJ's (Peachymix), so if you have chosen the Diamond party package you will also see her and DJ Spin at your event! Can my sisters/bosses/daughters sing with your Band? If one of your guests would like to sing a song, we are happy to accommodate this request providing that your guest is supervised by a band member. We usually have a spare microphone available. Please let us know in advance if this is the case. Unfortunately we cannot allow guests (even if they play an instrument) to use our equipment as it will invalidate our insurance policy. If you want to sing with the band on the night please read our Platinum or Diamond Wedding packages by clicking on the following link: WEDDING BAND and if you want to purchase this unique one off experience then please click HERE now. Can I see the Band play before booking? You can join the band’s various social media pages to see the latest gig information (click the Find us on facebook tab at the bottom of the page to see all of our public showcases listed as events). Alternatively we will post regular updates on our social media pages which are shown here on our website. Private functions are not usually listed, but most public performances are regularly announced which you are welcome to attend. If you do attend one of our shows please come and say hello. Cant make it to a Sonic Boom gig? Then check out our brilliant live videos on our media page on this website and watch lots of live videos on our bands facebook page or YOUTUBE channel. They should give you a flavour of how we get a crowd going and what to expect from a Sonic Boom show. If you can't make a show but want to read some comments from our previous customers please visit our FEEDBACK page. Sonic Boom will normally be attending your event for a minimum of 7 hours, during this time we can get a little peckish, so a provision for food is built in to our contract, so that we have enough energy to give you the best high energy performance that we can. Please see our TERMS AND CONDITIONS page for details. Do we have provide a changing room for the Band? Although we don't expect or demand a changing room we would love it if we were considered if there are events we have been booked for where we have long waiting times before we hit the stage. A warm well lit area for the band to chill in or get changed would be really appreciated. For most marquee and venue weddings we understand this may not be possible and we are happy to mingle with you and your guests (we are a friendly bunch) or find somewhere nearby to relax before we smash your party! Can you send me a risk assessment? We have been asked in the past to send over a band risk assessment by event organisers. This is usually for large corprorate events. We can supply you with one that we have completed and adhere to at every show we perform at. This identifies all potential risks and how we have addressed each one to minimise the risk of potential injury or damage to us, our equipment and to you and all of your guests. By reading this FAQ pack we have given you lots of suggestions of how we feel you and your organiser/venue can also minimise any potential hazards at your event , for example- band area/ staging /safe electrical power sources/ enough power for us/ security to manage large scale audiences. All of the bands equipment is PAT tested and we have public liability insurance, both of which can be sent to your venue or wedding planner/events organiser. Managing risk is not just the bands responsibility but you can be rest assured we take this very seriously and will always be professional and adhere to safe working practices at every event we are booked to perform at. If we do identify a potential risk during the booking stage we will make you aware of it and advise you on possible solutions if we can. If you identify any potential risks please let us know as soon as possible so we can address it together. Will I have to pay the Band a deposit? A small deposit is required for all private functions in order to secure the date as we do not take provisional bookings. This will be discussed with you during the booking process. The remaining payment is required the week leading upto your event via BACs transfer or upon the bands arrival at the venue of your occassion. Can I book the Band provisionally? Unfortunately, we dont take provisonal bookings as our demand is such we would be turning clients away on popular dates. However when you make an official enquiry with us it will be logged in our system and you will be given first refusal should anybody else enquire for the same date. What happens if one member of the Band is really ill or unable to perform? From our years of experience gigging,one thing you can not guarantee is someone falling ill unexpectedly. Now we have all been unable to go to work due to illness and being a professional act we do have musicians we know and trust on standby in case this happens. We will only call upon them like superheroes in extreme circumstances, and luckily all Sonic Boom band members are able to sing live, so if one member is unable to sing usually the other members can. This may mean we are unable to perform certain numbers and we would have to alter the set alittle but what it wont mean is that we just dont turn up. We will let you know of any changes and still arrive at your event ready to do the best job we can. We take pride in what we do so you will be notified of any line up changes if and when they occur. This is also covered in our TERMS AND CONDITIONS. How much notice would I have to give if I wanted to cancel my booking? I want to book the Sonic Boom Function Band, what do I do next? 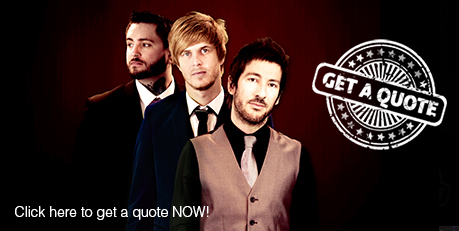 Please click HERE to go to our quote page and contact the Band directly. What venues have Sonic Boom performed at before ?